I bought a Camp Chef one-burner stove from REI that uses either butane or propane tanks. It is somewhat flimsy but should suit my simple cooking needs, mostly outdoors. I have no outdoor storage so the canisters will be stored inside the van. I’m not worried about the propane canisters but a bit concerned about the butane canisters, which seem less significantly substantial than the propane tanks. 1. Are butane canisters they more succepible to venting or other bad behavior when stored inside a hot van? 2. The stove instructions say to remove the butane canister when not in use. That’s a PITA for storage as a separate canister will not fit in the case. Is removing the canister really necessary? I've kept both inside seeing temps close to 120* and haven't noticed any trouble. However when it comes to flammable gasses, the best answer would probably what the manufacture suggests. I know they always go all out for safety just because of law suits. On a side note I have had both type tanks leak (seep) when disengaged. That is probably more of a worry of mine. I think the reason to remove the canister is simply so it can't be turned on by accident. I always kept the tank in but not engaged yet one time noticed I didn't. The box it comes in does a good job in keeping the control knob in the last position but removing the fuel makes it safe to company standards. Similar to a propane torch. I almost burned down a $300K work truck. Left the torch head on where it was stored. Driving to the next job I hit a bad section of the road. Everything in that tool bin jumped and somehow it turned the gas on and hit the pizo lighter. Then the explosion happened & that got me out looking at each axle cause I thought I lost a tire. At the job site one on the guys burned his hand on the bin latch. Everything inside was burnt and melted. I don't haul the butane stove anymore but still would probably still keep the canister in the stove, just not engaged. Listen to make sure it's not leaking before storing. I live with the risk but I'd hate for something bad to happen. GreyDawg, I wish I was staring at the Grand Tetons pondering the safety of my butane containers. I have one of the Butane stoves that you see in Asian markets. With no propane on board the van I'm committed to use the spray paint can type Butane canisters. On my stove model I leave the can that's in use in the stove but release the lever that compresses the can to feed fuel when I'm not using the stove. I hope that's an understandable description. Not sure if the REI dual fuel is designed like that. Here is some info on butane vs Propane so you can decide what best practices you are the most comfortable with. 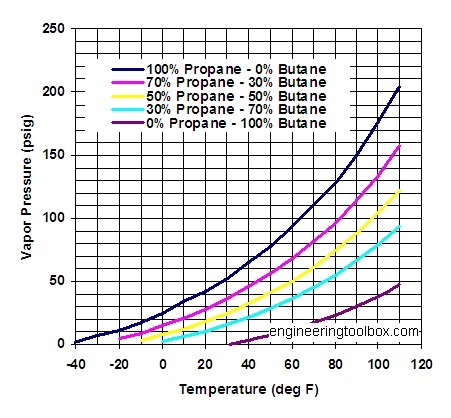 Butane has a much smaller range of vapor pressure based on temperature than propane. Assuming the fuels we are using are 100% butane or Propane (less impurities) at 120 degrees F butane is only 47 PSI vs propane at 200 PSI. This is why the 1 lb green propane cans are relatively heavy duty and the Butane cans are like spray paint cans. The Butane cans are designed to vent in an over pressure condition. The top crimp of the can will split slightly and vent out the contents at a set pressure. This method is called a Rim Vent Release or RVR. The RVR in butane cans are supposed to vent at 200 PSI with visible and audible deformation of the top as a warning before venting. So armed with that knowledge even if you placed your butane can on the dash of the van, in the sun, in Phoenix and your butane got up to 175 degrees you would be at 132 PSI. Theoreticly well under the 200PSI vent pressure. I don't recommend doing that but the idea keeps me from worrying about temperature in the cabinet in the van. Fun Fact - Butane below 33*F will not vaporize and you can carry it around in a bucket. Which is why many camp stoves mix other gases, acedyline, propane, ect to improve the cold temperature performance. Which is why all the above info is out the window with mixed gasses. Hope this helps put it in perspective. I'm more concerned with my butane cans not leaking out the valve when off, keeping the little red caps on unused cans so they don't get pressed accidentally, or just rolling around. Thanks, all. I think I will keep the canister in place but unlatched, and give it the sniff test. I will store the spares with the propane bottles. Re: keeping a watchful eye on the Tetons on a brilliant June day. Tough work but someone needs to do it! GTNP is relatively empty. Alas, Yellowstone is already a traffic jam parking lot. Anyone recommend a specific butane 1 burner? REI used to sell one... but the butane cans that were sold at my nearby asian market were not compatible with it. i'm a little concerned with ease of getting the butane cans... no obvious source around here...... especially as that asiam market sold a kind that only worked with the $28 stove they sold. Did you take the little unpaved road along the river? Super ride and usually 2wd friendly. I really miss that place. I also looked closely at the GasOne dual fuel stove (Amazon) but went with REI because I am a member and because returns are easy if the product is defective. (The metal door on the canister compartment is flimsy and easily bent because you pull on one corner, but I can live with that). I am using the butane canisters from a Korean grocery market - 4 pack for about $8. I thought that butane canisters were standardized. No? I return to GTNP whenever I can. It feels like home. The river is super high and fast right now due to massive snowmelt. I will check out the road. Saw a moose cow and calf early this morning on Gros Ventre river. Beautiful. This thread brings up the terror of experience. I use my van to snow camp quite a bit. My son and I were camped up on my St. Helens for a backcountry snowmoboarding trip. About 4 am the van was rocked by what we thought we RPG equipped Sasquatch. We totally freaked out and then thought the axle broke under some strange cold induced load. It was the middle of the night. As we scoured outside to see what might be trying to either blow us up or sabotage the van we found nothing. After an epic day we came back and as we were organizing the van I noticed my camelback was shredded beyond belief. Kinda weird I thought and as I picked it up a pancaked large CO2 canister falls out. I know it’s not propane or butane but my webasto heated it up to RPG temp. It still freaks me out thinking about it. We both have overdeveloped imaginations and so were traumatized equally. Tire inflators need to be away from heaters boys and girls. We use the GasOne dual-fuel and have had really good luck. When it wears out, I'll probably get the cheaper Butane-only version. We buy canisters by the case on Amazon. Yeah, the stove is kind of cheap, but it keeps working and it is extremely easy to deploy. With the little canister inside, there is no groping around hooking up the heavier, more awkward, propane bottle. Another excellent feature is it's flame control.. you can actually turn it way down (assuming no ambient wind) but if you open it up, it'll boil water, or whatever, faster than at home. All the campstoves that I have tried have very poor flame control... it's either the 'blow torch' setting or 'Bessemer furnace' setting.. very difficult to get them low. It looks like the mkt is flooded with these stoves--some under $20--and they all look like they're probably made in the same factory in China. I'd rather have two of them than a two-burner campstove.